Saga of Tanya the Evil is one part thought experiment, one part modern tragedy, and one part subverted anime tropes. 2) or a human whose moral compass is protecting free will and being the best employee possible, especially if that means using other humans as shields. For religious viewers, it is important to emphasize that this being calling itself god in this show is a caricature of the Christian god called Being X by the protagonist. "Being X" has a single-minded fixation on having humans worship him. When the protagonist Tanya points out flaws in Being X's methods of achieving widespread piety, the Being X rashly jumps to the wrong solutions to solve the problem instead of asking for advice. For example, Tanya blames scientific thinking for people not needing god for understanding the universe, so Being X recreates the Universe with magic. Tanya blames good standards of living on people not asking god for divine blessings and aid, so Being X recreates a world where everyone lives miserably (trench warfare). None of this actually works, so the story follows Tanya as Being X comes up with more and more failed plans to make Tanya pious. The story is basically evil versus evil, so people are going to die, and moral atrocities should be expected. I don't know what happens in the very end, but regardless of whether Tanya faces justice or not, it will probably be tragic. The main character is a loli, so that is probably the most cliche thing in the anime universe. Sociopathy (yandere) is not all that new either. What makes it so strange is having the loli appearance and voice quickly undermined by the very mature, cold, and calculating salaryman mentality. Sure we have had yandere characters before, but those were obsessed with their senpai. There is no romance here, no love triangle. It is just coldblooded murder. It is so different from what we usually expect from the loli character that it makes the cliche refreshing. But the big question: Is it good? The animation and the first episode definitely had their flaws, but the series becomes better as you watch it. It is definitely worth watching just for the novelty of its true subject matter. In other words, the series is good. Well I'll first say that I was looking forward to this anime when I first found out about it. I do like military shows quite a bit. It's also set in a world where a war (definitely not World War I) between an empire (definitely not Germany) is fighting against a group of allies (definitely not France, Russia, etc.). This only furthered my interest in the show. I did hear certain summaries of the series beforehand (which I will not divulge here) that only made it more intriguing. Some of the character designs are cool to look at and the characters themselves seem to present lots of opportunities. This also seems to be a series with a main character that's not really a good guy and is also really powerful from the start (something else I enjoy). People who like military and/or magic series should give this a try. After the first episode I was mildly interested, after the second I'm ready to watch it till the end. If the idea of WWI style warfare mixed with magic appeals to you, you should be happy to know that this has a interesting plot and main protagonist to go with it. It's to early to tell if the show will continue to hold my interest, but it seems off to a great start. Just so everyone knows - this is a magical version of the WWI conflict - and unlike WW2, there was plenty of fault to go around. Looking back as a history buff, if you want to make them good guys/bad guys, the Germans were probably 55% of the bad-guys, but circumstances mostly pushed them into attacking a neutral country or two because they thought that it was the only way they stood a chance was by beating France before Russia got mobilized - and they were forced into fighting Russia due to alliances & the morons who killed Archduke Ferdinand (who was actually one of the most pro-Serbia person in his government). But anyway - after the 2nd episode this series has intrigued me. I was borderline on watching after the 1st, but there's not much else that I'm into this season either, so I figured that I'd give the 2nd one a go. I'd suggest getting through ep 2 before making up your mind about it. They basically did the ol' ep 1 for the action craziness while ep 2 starts in on the plot legwork. Seems solid thus far. My review is to anyone who might be thinking of avoiding this anime due to the multiple 1 star ratings calling it a WW2 anime that paints the germans as the good guys which is entirely false and shows a bit of ignorance on the side of those writing the review. Well the fact is that this is nowhere near a WW2 anime and it just show's peoples ignorance (Those with any historical sense will know this is a WW1esque anime with a fantasy element thrown in, only difference is is that they've removed all of Germany's allies so they're surrounded on all sides). Additionally if they're fighting in trenches and doing bandit rushes then it's a good bet that it's not a WW2 anime as those were more the tactics employed in WW1. So I went into this without knowing anything about it. All you need to know is it takes place during in an alternate world where world war 1 either started or lasted longer and mages are used in battle. If you liked Izetta I think you will like this as well. Another reviewer stated this starts in the middle of the manga but I had no problems picking up what was going on. Also Tanya is a psychopath and I love this even more because of that. This is an interesting show, just keep watching! For starters, this is a pretty interesting anime with war, guns, and magic. 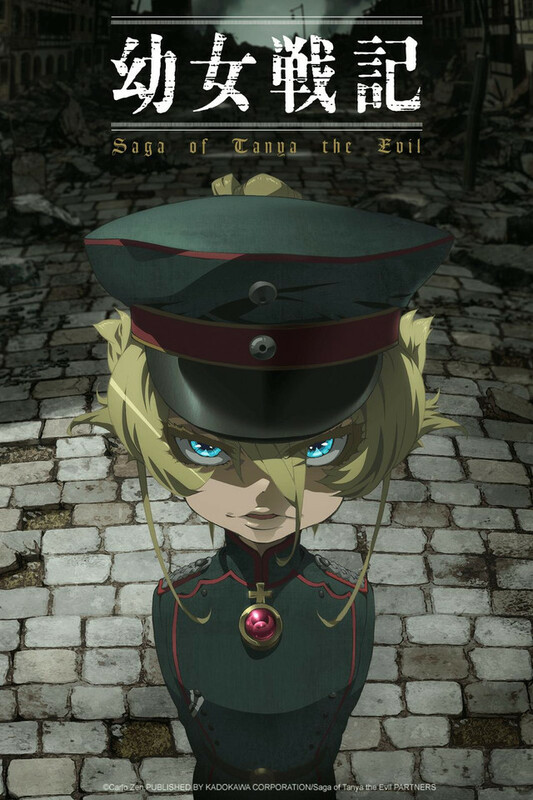 It revolves around Lieutenant Tanya, which seems demonic to the enemies because of how powerful and talented she is already at a young age, but as of episode 1 it doesn't explain how Lieutenant Tanya got there. I understand that they might want the viewers to have a more impactful view of the anime at a glance, and wants us to question things about why this starts out in the middle. I think it's not necessary for us to judge it when the anime has barely begun. All in all this is an anime you should keep an eye out for. A quite good and interesting show. Although untill now the quality of the sound isn't so good the show is still very enjoyable.The graphics and the details on each character are very good.What also,is good,about this show is that it shows a type of -dere that is not shown much in anime.The fact that it takes place in 1923 is quite interesting too.The realationship between each character and how it (propably) evolves is also a good reason to watch this show.The way that the mix the colors gray and black adds another unique and good touch in the show.In conclusion it is quite a good show and worth watching. Alternate WW1? Going to be different to ours? I have read things on this anime as it is set during an alternate WW1 compared to ours setting in early 1920's. I have not read all of the short stories but I do have a strong feeling that the Central powers are going to lose the war no matter how hard Tanya tries. Tayna's fate is yet unknown either she is going to survive the war with alt-Germany surrendering or dying during the last days of the great war. After watching the shorts where Tanya can fly and shoot allies down does not mean the allies might put their own magical girls of their own to challenge her title. No matter what I would like to see how the war ends on the side where the Allies won the war.